A 70-Year-Old Asks: Can I Afford to Retire? Jack (who asked that we not use his last name) works full-time at an environmental agency for the state of Tennessee, earning $60,000 a year. But the daily grind is wearing on him. In November, he'll be 70. "Old age is making it harder and harder for me to get up early every day and put in eight hours of work," he says. "But with the poor economy and uncertainty of the future of Social Security and Medicare, I am scared to retire." Jack emigrated to the U.S. from the Middle East after high school and finished his education here. Unlike the millions of older Americans who have too much debt and too little savings, Jack has no debt at all, and has socked away $300,000 in his 401(k) and Individual Retirement Account, invested mainly in a conservative fund paying 3.75%. Federal rules require Jack to start taking mandatory withdrawals from his IRA in June 2012, and also from his employer plan if he retires by then. If Jack retired today, he'd also receive $2,500 a month from his state pension and Social Security. He also rents out a condo he owns, clearing about $250 each month after expenses. He finds it stressful to deal with tenants and upkeep, but has no plans to sell, since the unit is worth less than $25,000. Finances are a sore subject between Jack and his wife. She earns $60,000 a year between a part-time job and investment income, but spends every dime she makes. "She does not believe in saving for retirement and she does not have any savings," Jack says. "It creates a lot of arguments when I talk to her about these things." She pays the utility bills, but otherwise doesn't contribute to household expenses. Jack started working with what he calls a "conservative" financial adviser, but has been disappointed. "So far he has not produced any gains to my savings, and actually, I have lost a few thousand dollars," he says. The adviser invested $26,500 of Jack's money in four relatively obscure mutual funds and a silver mining company in July 2011, which collectively have fallen 7.5% since then. The adviser also recommended that Jack buy an annuity with a 3% load that offers a 6% return (it's unclear whether that return is guaranteed in full or in part, and if so, for how long). Jack has never tracked his spending carefully, but estimates his monthly expenses at about $3,000. Beyond that, he's worried about the potential costs of catastrophic health care. "With health care costs spiraling and increased health problems as my wife and I age, we need enough income to cover all these expenses without going broke before we die," he says. Family history suggests he'll need his money to last 15 or 20 years: Jack's mother is 87; his father died at age 84. So can Jack afford to retire? The short answer: It depends. First, he needs to get a real picture of his costs by tracking every dollar he lays out over the next six months, and reviewing his checkbook and credit card statements for the last 12 months to capture annual bills, travel and other big-ticket items. That will form the basis for his monthly budget. Fortunately, Jack's Social Security, pension and rental property provide a steady, guaranteed income stream. He should think of that as his "salary" to cover necessities, and the money from his investment portfolio as his "bonus," which can be used to fund travel, entertainment and other discretionary spending. As for medical expenses, Medicare typically pays up to 80% of costs. Jack could buy a Medigap policy to cover his co-payments, or consider a Medicare Advantage plan. These policies, offered by private insurers reimbursed by Medicare, must provide the same coverage as the federal program, but can offer extra benefits, such as lower deductibles and co-payments for members who use in-network doctors and hospitals. Spending More Than He Thinks? I spoke with two financial advisers about Jack's situation, and they disagreed on whether Jack should retire immediately. Charlie Farrell, a principal with Northstar Investment Advisors in Denver, suggests that Jack's monthly expenses are probably higher than he estimates, and that he and his wife need to work out their spending conflict. "If they agree on common goals, lifestyle and expenses, then they can make it work, even in the face of some health care costs," says Farrell. "If they can't get to a common agreement, they just don't have enough capital to create a meaningful income stream if their real expenses are in the $5,000 to $6,000 per month range, which I expect they would be if they've been living on $120,000 per year." Farrell also shares Jack's concerns about uninsured medical costs, which he estimates at $5,000 to $10,000 annually, depending on health and prescription drug use. "A few years of either spouse needing long-term care or assistance could wipe them out," he says. "They won't qualify for Medicaid unless they have spent down all their assets, so it's a real problem." But Jane King, president of Fairfield Financial Advisors in Boston, says Jack is well positioned: "It hardly ever happens that you have two sources of income that are not affected by what's going on in the market." King advises Jack to put 50% of his $300,000 portfolio into mutual funds invested in blue-chip, dividend-paying stocks. "It would be a slow-growth and diversified value approach using funds that are no-load and have low fees," she says. She suggests fund families with a long-term track record, such as American Funds or Vanguard. Steer clear of the annuity, adds King, particularly one with an upfront commission. Jack's first five years in retirement will probably be the most active and the most expensive. "He'll travel, play golf, whatever his passion is," says King. "So maybe he's okay taking a little more than the minimum required distribution. But running out of money before he dies is obviously a concern for everyone." The key is carefully tracking the rate of return on his investment portfolio so it can sustain the withdrawals. Meanwhile, Jack could address his health care concerns by purchasing long-term care insurance with a waiting period of six months to a year, adds King. 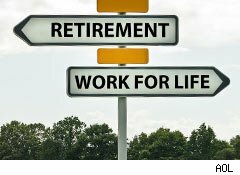 Finally, Jack could ask if his employer would allow him to retire, take his pension, and then work part-time on a contract or hourly basis. It may just give him the resources and confidence he needs to leave behind his full-time job. Struggling with your own personal finance situation? I welcome your questions but it's also about your wisdom, ideas, and experiences that may help other readers. Email me at laura.rowley@teamaol.com. You can also follow me on Twitter @MoneyHappiness. Content Solely Informational: Content on this site is for informational purposes only and is not intended to be investment advice, or any other kind of professional advice. You must determine for yourself or in consultation with a professional whether any financial strategy or advice is right for you.